One budding Midlands jewellery designer has been given a unique opportunity with the Museum of the Jewellery Quarter to be its first Jeweller in Residence, a project which aims to support emerging jewellery designers. Winner Fiona Harris, who previously studied at Birmingham City University School of Jewellery, is the first designer to be crowned with the title. 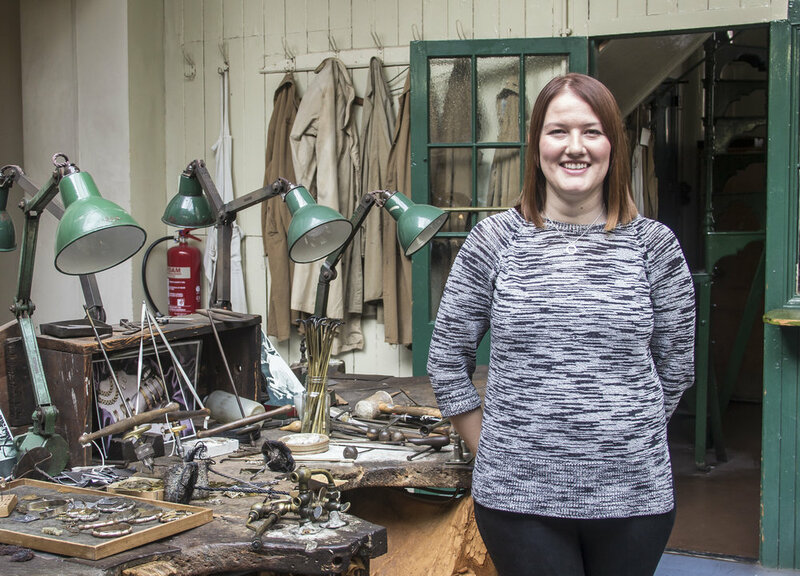 As part of the prize Fiona, now based in Nottingham, has the unique opportunity to work from the Museum of the Jewellery Quarter’s perfectly preserved jewellery workshop for the next year and have her bespoke handcrafted jewellery sold in the museum’s acclaimed shop. The initiative by Museum of the Jewellery Quarter, in partnership with Birmingham City University’s School of Jewellery, aims to offer opportunities to up-and-coming jewellery designers and asked entrants to design a two-piece jewellery range inspired by the historic Smith & Pepper jewellery manufacturing firm at the museum. Fiona shone through to win the competition with her creative ideas for a pendant necklace and earrings inspired by one of Smith & Pepper's most iconic designs and the snake-like features in the Museum of the Jewellery Quarter logo. She is now spending some time at the museum immersing herself in the history and looking through the archives to develop her designs further. The designer has a strong belief that jewellery shouldn’t be saved for a special occasion but loved, cherished and worn every day. The winning designs will go into production and be available to buy online at shop.birminghammuseums.org.uk and in the Museum of the Jewellery Quarter shop from just before Christmas. The Museum of the Jewellery Quarter is built around the Smith & Pepper jewellery manufacturing factory. In 1981, when the proprietors of the firm retired, they simply ceased trading and locked the door. Today, this factory is a museum, which tells the unique story of the Jewellery Quarter and Birmingham’s renowned jewellery and metalworking heritage. Alex Nicholson-Evans Commercial Director from Birmingham Museums Trust said: “It has been fantastic to partner with the School of Jewellery on this project. At the Museum of the Jewellery Quarter we celebrate the heritage of the area, but it is also important to support the next generation of jewellery designers too. Dauvit Alexander, senior lecturer in Jewellery and Silversmithing at Birmingham City University’s School of Jewellery, said: “This is a very exciting opportunity for a graduate from the School of Jewellery to work in an important historic environment and create something unique from that experience.